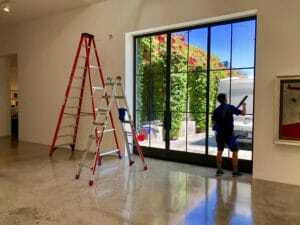 Los Angeles Residential Window Cleaning Tips: Hard Water Stains - L.A. Elite Window Cleaning, Inc.
We have all seen them, and your typical window cleaning methods don’t seem to remove them – hard-water stains. 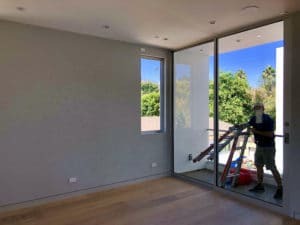 In this post L.A. Elite Window Cleaning will go over what causes these, how you can remove them yourself, and what can happen if they are not taken care of in a timely manner. Let’s jump right into this and see what causes these buggers. Hard-water stains can be caused by a combination of things, especially while living here in Southern California. Salt and minerals can be carried in from the winds passing over the ocean, acid rain, sprinkler systems, or by varies airborne contaminants here within LA’s bustling urban setting. Over time these contaminants can build up on a buildings exterior, but most noticeably the windows. This build-up can be seen as patchy white areas or cloudy spots similar to those seen on shower doors. The minerals that are build up on the glass are not only visually unappealing, but they are corroding your glass as well. You must keep in mind that glass is not as smooth as it appears and feels. If you were to highly magnify glass you would see that it is actually quite a porous material. If these stains are not removed in a timely manner the glass may permanently appear stained or scratched. If the stains have been on the windows for quite some time you may want to give a professional, like us, a call to prevent further damage. As always we would like to thank you for checking out our post, we greatly appreciate your time and hope that this was beneficial. Saying that, just in case you missed some of our previous window specific blogs we encourage you to check out the following: best time to clean windows in LA and clean windows – Los Angeles home selling tip.